An early morning wake-up to check-out the Star Palace Hotel. We leave our luggage to take advantage of an entire day in New Delhi. As for now we have no concept how to handle lack of connections to Varanassi. Problems should not be solved before having breakfast. We visit Golden Cafe, a familiar bar. As it turns out that Golden Cafe is not only a bar and a foreign exchange office. It also sells bus tickets. Wide-range of services is key to a good business in India. We eat a second dish having already a new concept. We are taking a overnight bus to Rishikesh, a randomly picked destination. The destination is to the north. We’re almost ready to leave. There is just one of the passengers earnestly trying to help his obese wife get on the bus. After several attempts, unfortunately, he is not successful. The husband with a speck of humiliation in his voice admits “I’m sorry, my wife is too fat to get on the bus.” They made a decision to take another bus. We set off. There are two mad Korean girls with us who keep talking and telling incredible stories all night long. In this fashion we reach our destination. 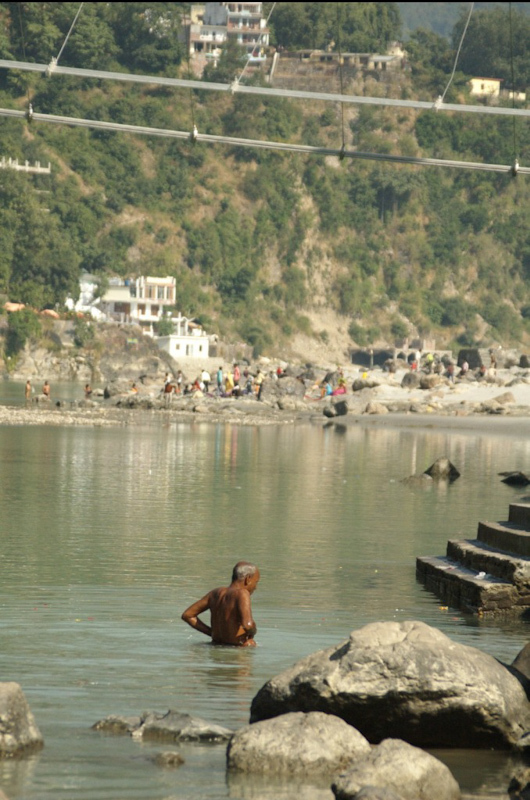 Rishikesh is renowned for plentiful monastery-run Buddhist schools. Surely this is an interesting thing to do. As a rule, you must commit for at least one month period. The training in monasteries spread along the Ganges is with no doubt an interesting life experience and a sufficient reason to go back to these spiritual places. In contrast to Kashmir, where I saw literally three or four tourists, here they are abundant. Fortunately, they do not disturb local life as most of the visitors found this place not accidentally. It is a haven for relaxation, contemplation and reverie. The scenery is accompanied by herds of long-tailed macaques running across suspension bridges across the picturesque Ganges. 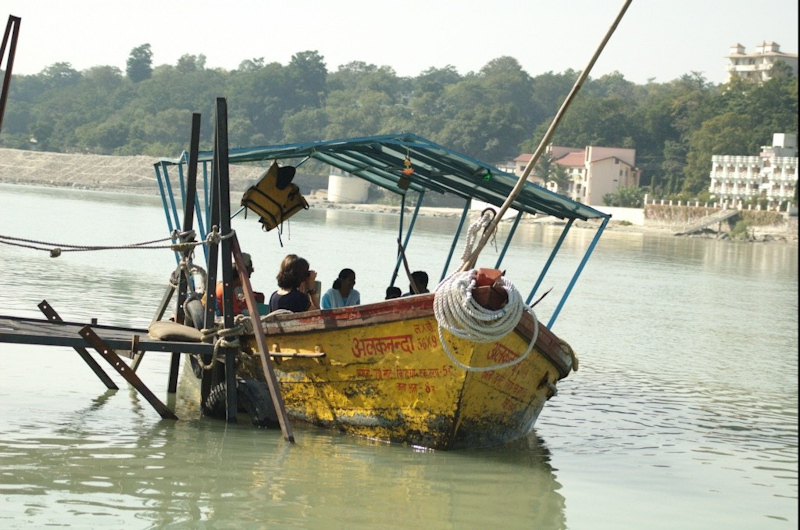 Rishikesh lies on both sides of the river. The town is subsequently divided into a kind of a downstream and upstream part. We are far upnorth India, far enough for Ganges to be not contaminated. Water seems to be clean. Some people bathe, others let downstream small flaming boats in the memory of the dead and pilgrims from distant parts of the country fill canisters with holy water from the Ganges. I noticed that the sale of these water containers is quite a profitable business here. We get to know a guy who seems to be an Indian counterpart of Bob Marley. The guy gives us his ideology for life. "Money is not needed, as it passes like wind. Once you have them, once they are gone. Happiness is brought by other values and these can be achieved without material resources." Half an hour passes, we come down the steep and rocky Ganges riverside. At some point, unexpectedly, a wide-angle lens slip out of my friend’s backpack. I hear the lens hit the rock, then a second time again to finally the third hit of a form resembling a silent splash…. This is the way Ganges took its sacrifice worth at least a thousand euros. Bad luck, fate or maybe self-fulfilling prophecy – it is not known. What is know is that we have became speechless. It would take some time until a good mood of my travel companion comes back. Evening time we return to this place to get a few shots of the Lakshman Jhula bridge. 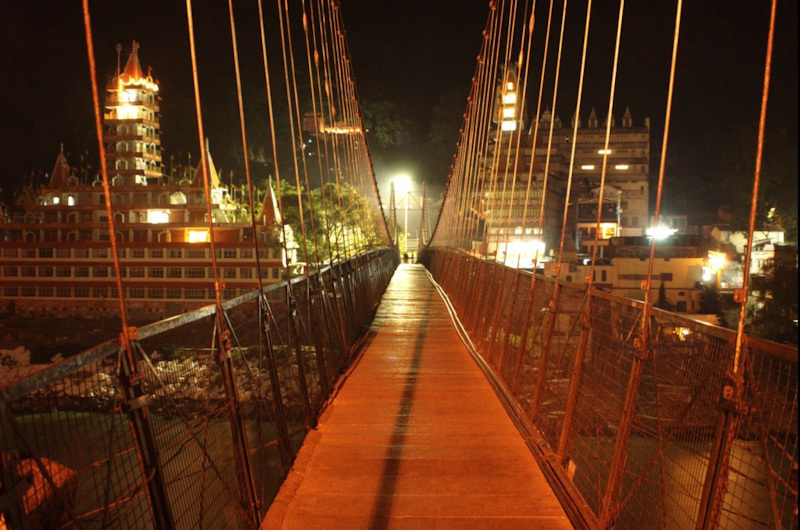 At this time the bridge is highlighted with warm lights, giving its glamour proudly spanning over the Holy River. We stay the night in Ganga View Hotel. I assume that we are the very first customers after the renovation. We get a freshly redecorated room, the one not occupied yet. In the hotel not all the repair works have been completed. This also applies to our room. Construction workers are by far not embarrassed to go inside our room and politely ask if they could use a drill to bore the missing hole. I hear “sorry, just ten minutes" and a team of workers is already here drilling a deep hole above my bed. Upstream Ganges there is a waterfall. So we walk and along the way we get to know Jal and Gal, a very nice Jewish couple. I do not remember which of them is a female name and now it is even harder to tell apart. We walk along a mountain trail leading to the waterfall. We meet a herd of curious macaques peering at us. 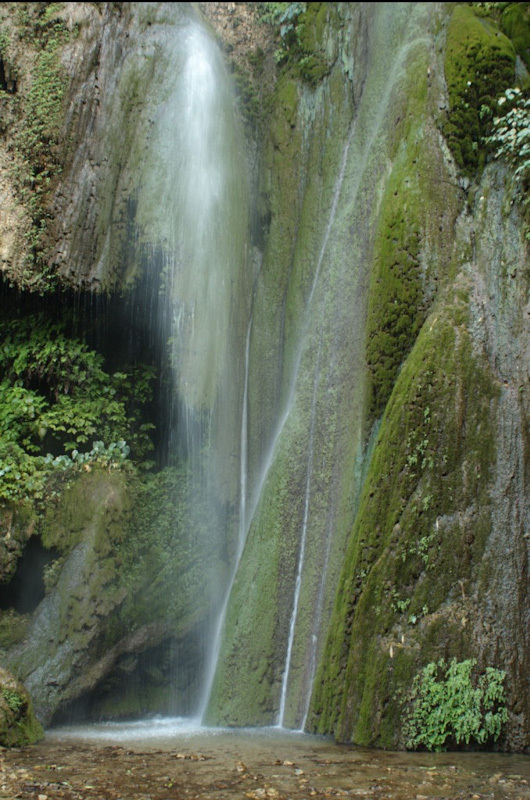 The road is poorly marked, however, thanks to massive quantities of water crashing loudly against the rocky ground after passing threshold distance it becomes easier to head towards the waterfall direction. The forest gets here a bit more sunlight. Some rays break through the boughs of trees. Flashes of light appear magically illuminating the steamed water. It is yet another inspiring place. Eat dinner at La Bella View, a rooftop restaurant overlooking meandering Ganges. Right after we move to Freedom Cafe getting a papaya lassi there. That is a popular local drink, similar to salty yogurt mixed with fermented cow’s milk. Lassi is served with ice cream and fresh fruit and it has an amazing taste. A sensual twilight sets in. Lanterns hung low over the tables give a soft, gentle light. Our comfortable seating and a quiet, atmospheric music puts us and a few travelers around into a state of oblivion. All the time I enjoy my papaya lassi and admire a unique view of the vast valley of Ganges with mountains on both sides covered with lush vegetation. This is an extremely memorable evening, accompanied by a set of modest fireworks to celebrate Diwali festival. We eat breakfast in the same place. Power-cut greatly increases waiting time for the order. However we are not in a hurry. Actually we have time. A lot of time. At the bridge Lakshman Jula buy cakes baked on the spot to take a bus to Haridwar, a second, slightly larger, but also situated on the banks of the Ganges of the city. We move an hour downstream river. Haridwar has lots of stalls on narrow and crowded streets. With bustling pedestrian traffic the city is still far less touristy than Rishikesh. It has more of its own local life going on. The Ganges flows here very fast. The local tradition or some kind of entertainment is jumping into the river in order to face the strong current and try to somehow get out of it. “Which country you from?”. Getting curious, I give the answers to the questions so that the next one I would hear is “How much would you like to donate, sir? Minimal donation is 100 Rupees. Absurd. 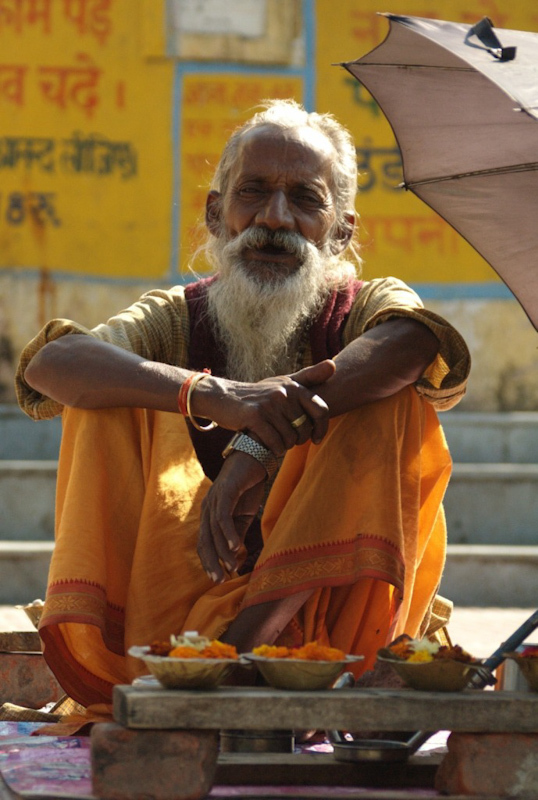 So we ignore this gent to finally eat our papaya and tangerines on the Ganges riverbank.